The temperatures here are finally beginning to dip, and I can actually begin to feel Autumn in the air. While my Pumpkin Spice Earrings initially set the mood for Fall, that was only wishful thinking as it was still hot as blue blazes down here. Granted, it's only down to the mid-80s, but it makes a huge difference for sure. 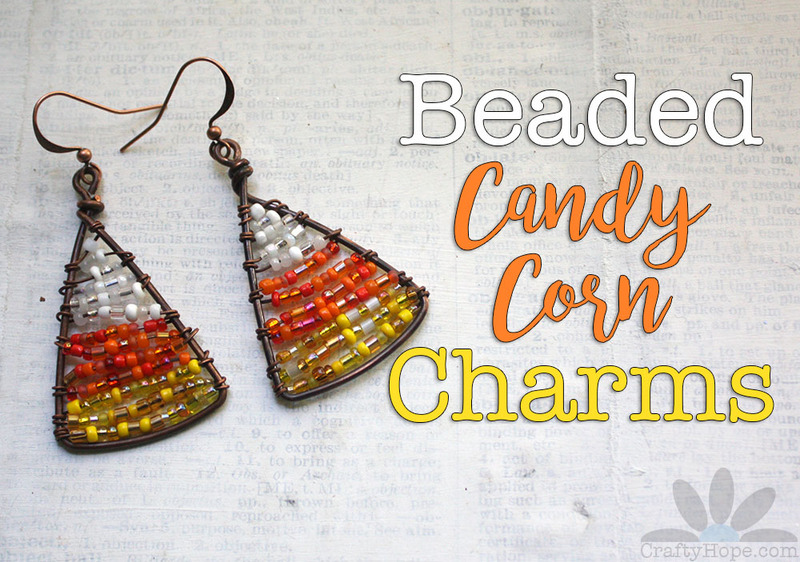 One of the many icons of Autumn is candy corn. 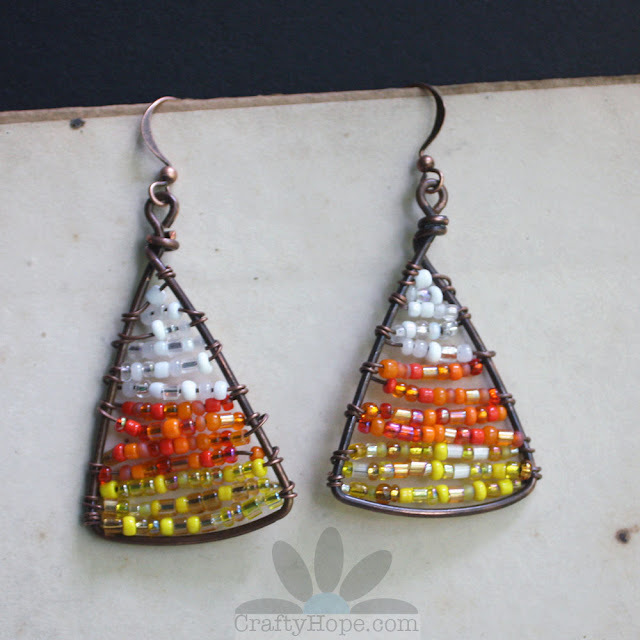 Its simple shape and color scheme are perfect for a quick project. 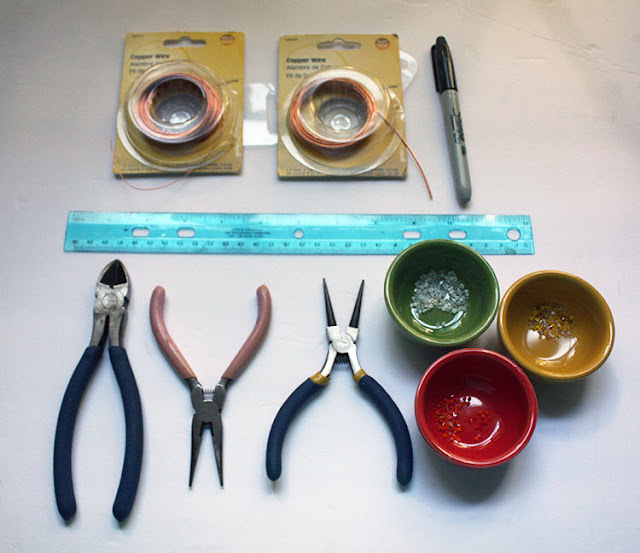 All you really need to get started on this project is wire, beads, and a few jewelry tools. I used 16 gauge and 24 gauge copper wire that I darkened with Novacan Black Patina, but you can use whatever type of metal you like best. 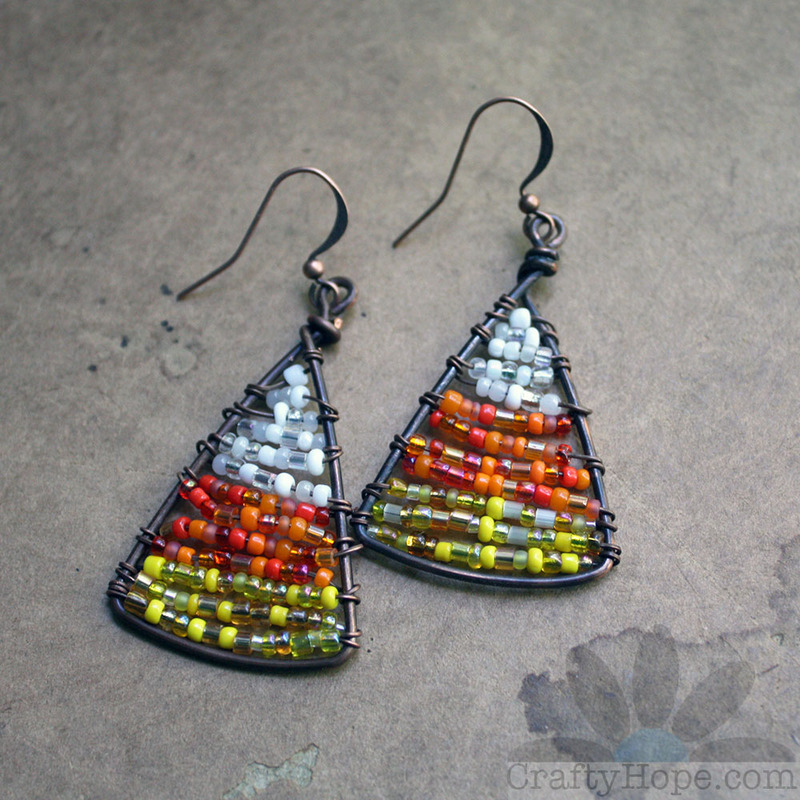 To help make the triangular shape, I used a basic ruler, permanent marker, wire cutters, chain-nose pliers, round-nose pliers, and seed beads in white, orange, and yellow. 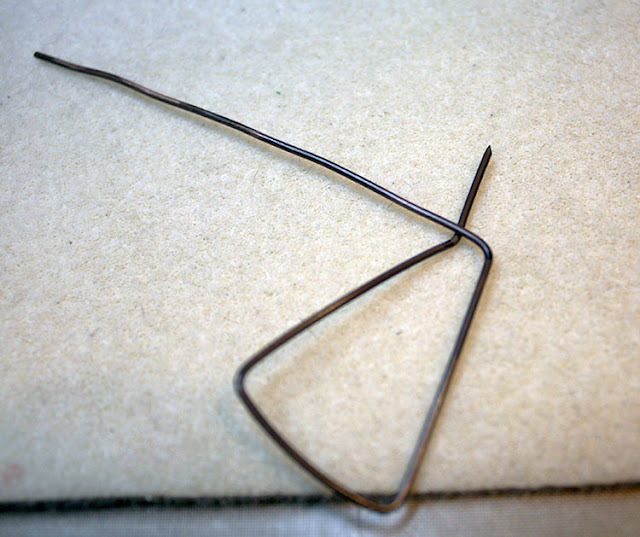 To begin, cut about a 6-inch length of the 16-gauge wire and make a right angle bend about 2/3 of the way down the wire. 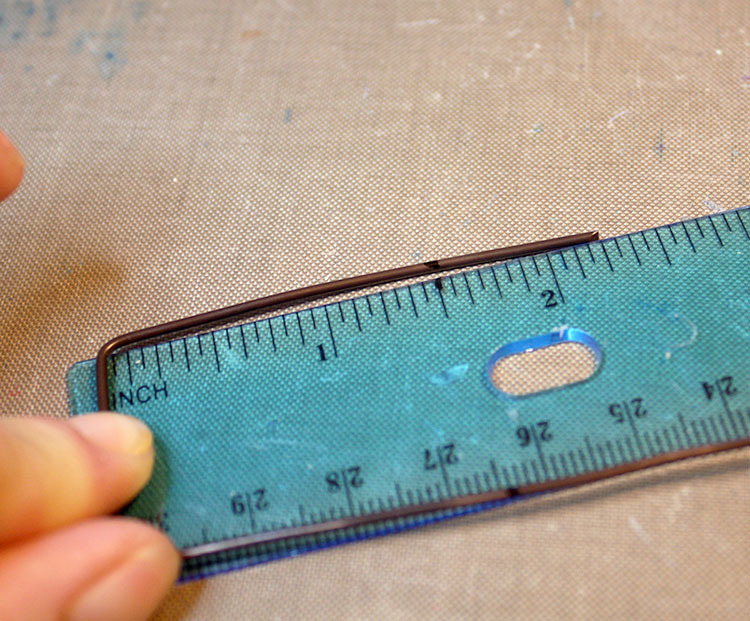 Measure one-inch along the long end of the wire and make another right angle. This forms the bottom of your candy corn. 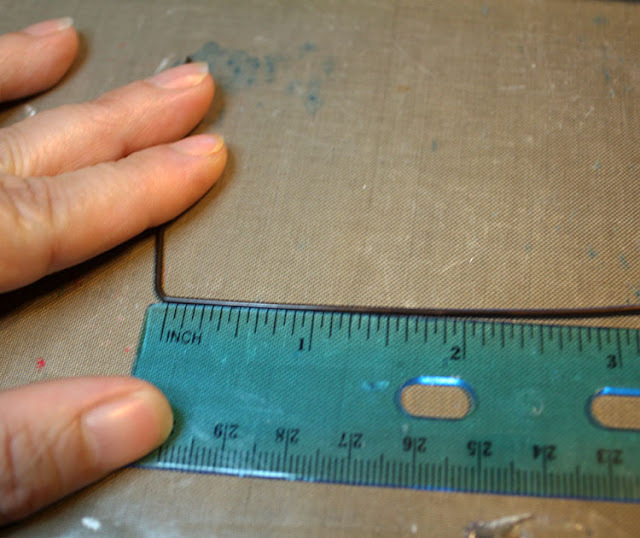 Use the permanent marker to mark 1 1/2 inches up from the base on both sides of the wire. This is where you want the wires to cross to complete your triangle. Bend those two arms toward each other so they cross at the marks. From there, bend the longer of the two wires toward the other one at another right angle. Then, bend the shorter wire directly upward. 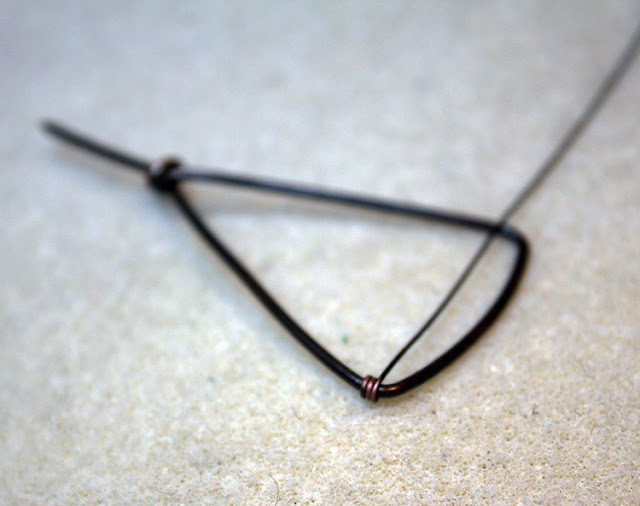 Wrap the longer wire around the short one, just like you would in order to make a wrapped loop. Trim away the excess wire. 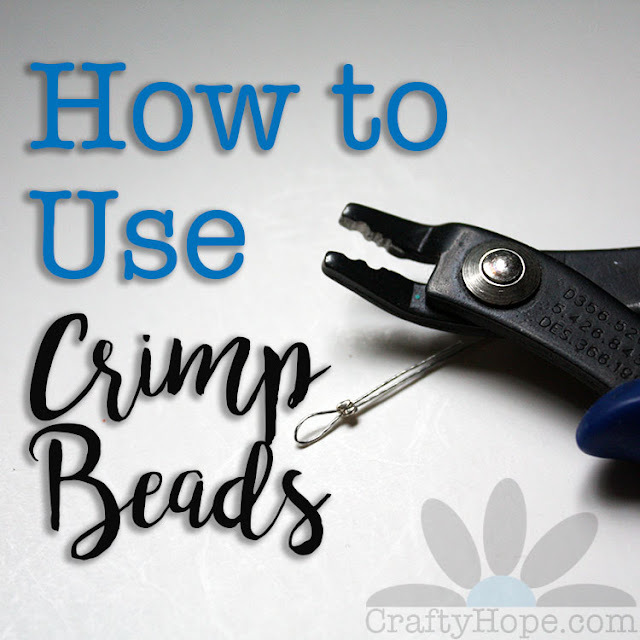 Here, I would just like to note that the beads I used for these charms are seed bead mixes I made myself from some of the beads I had on hand. Cut about 1 1/2 feet of the 24 gauge wire. Wrap this wire around one side on the candy corn frame several times like pictured above. Trim away and tuck the excess as necessary. 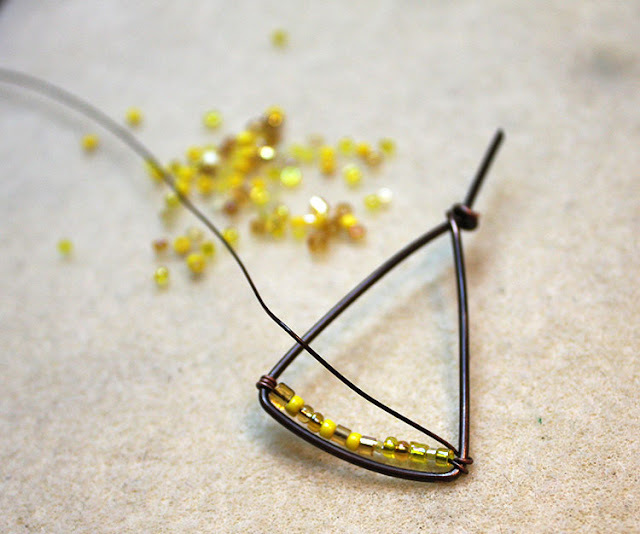 Add yellow beads to the wire to fit inside the frame. 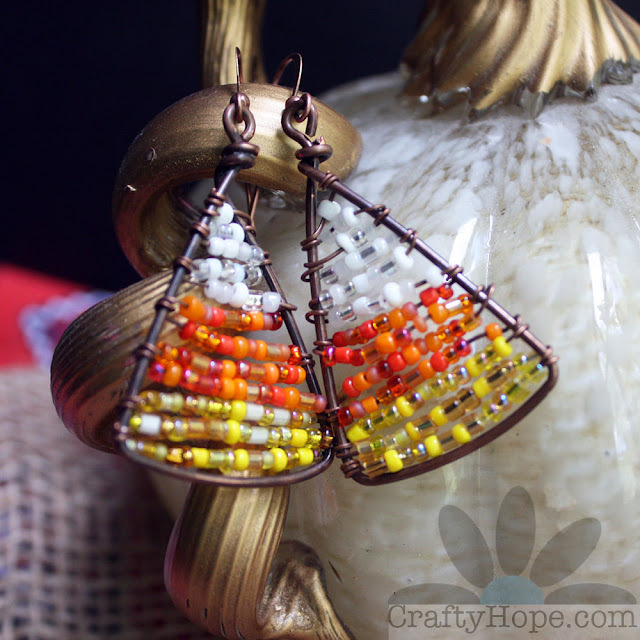 Wrap the wire around the frame then repeat adding beads and wrapping the wire to fill up the frame. 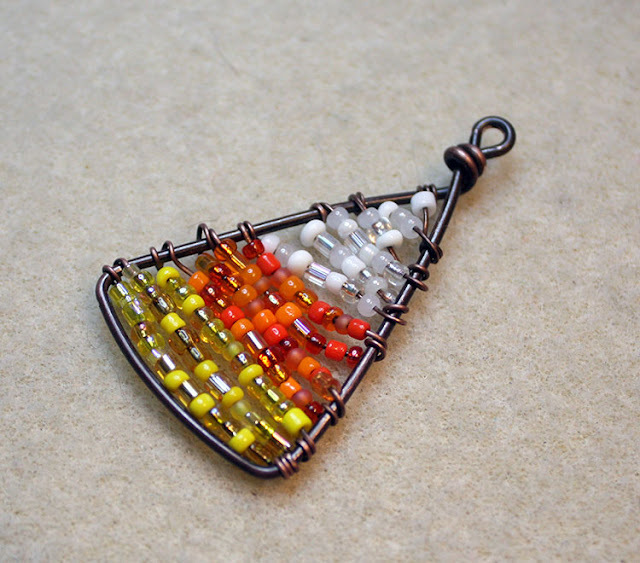 Remember to switch the colors as needed to complete the candy corn pattern. 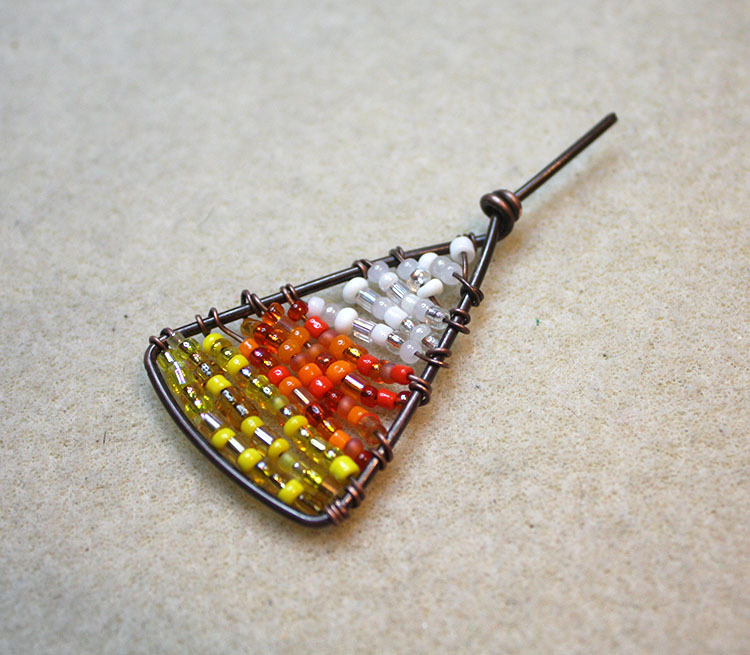 Complete the beadwork by wrapping and trimming the end of the wire. 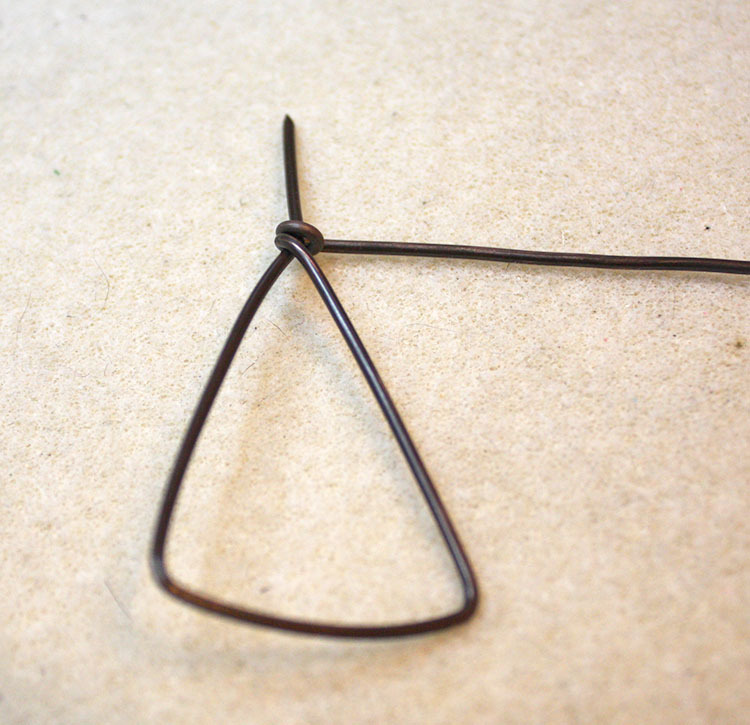 Finish the charm by making a simple loop with the wire that left sticking up. If any of these instructions are vague, I've also created a video to show the process. Of course, if you're still unclear about the instructions about how to make these Beaded Candy Corn Charms, please don't hesitate to ask me to clarify! I made two of these small charms to create a pair of earrings. 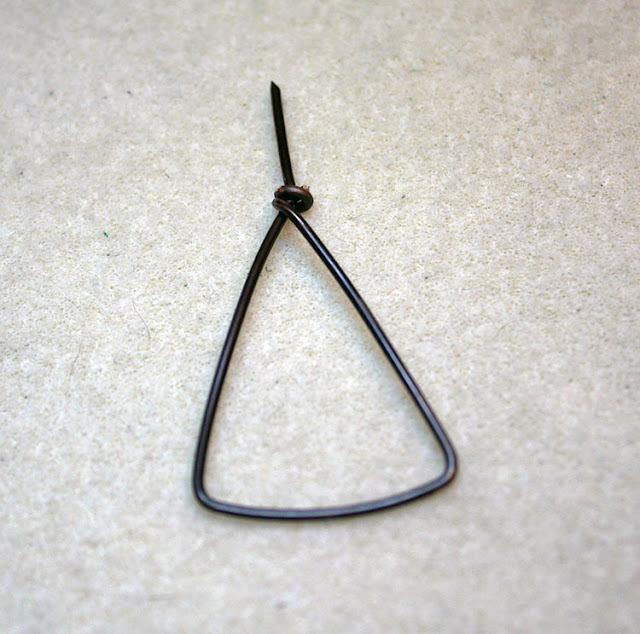 However, I could absolutely see increasing the measurements for the frame to make a great necklace pendant too. I really like the bead mixes I created. 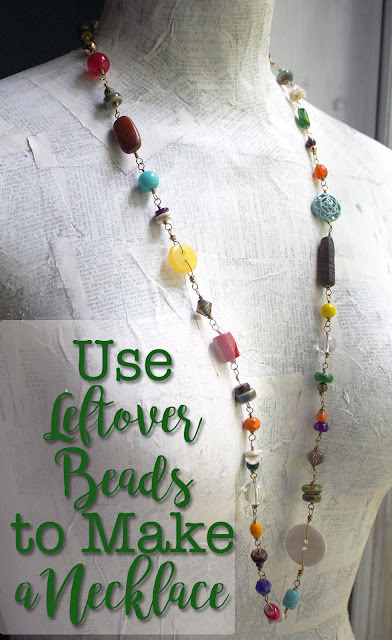 I think the mix of bead colors and finishes gives the charms texture and interest. I also think the darkened copper adds warmth and more of that Fall feel while giving the outline of the charms definition. I do mean it, though, if you have any questions about how these were created, please let me know so I can answer them for you. Now...welcome Fall!! I'm sharing this post on the following link parties. Make sure to check them out for loads more inspiration and crafts. Flaunt It Friday, Handmade Hangout, Friday Frenzy, Dare to Share, Saturday Sparks, Sweet Inspiration, Saturday Sharefest, Nifty Thrifty Sunday, Snickerdoodle Saturday, That DIY Party, Sundays at Home, Mad Skills, Made by You Monday, Tutorials & Tips, Inspiration Monday, Cooking & Crafting, Beautifully Made, and Recipe & DIY Linky. 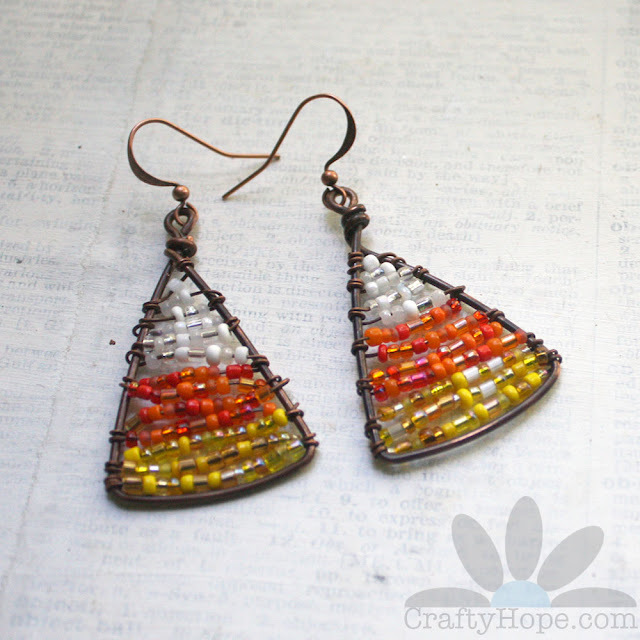 Great tutorial and very cute earrings. 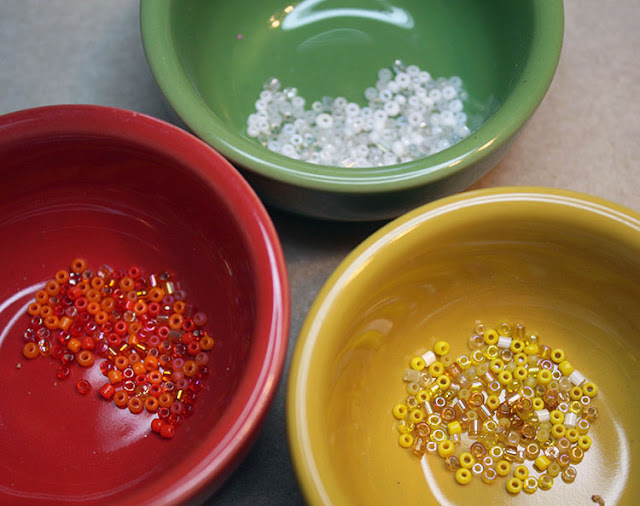 Your bead mixes work great. What a fun project, not to mention the possibilities for other holidays, too! Love the project. Thanks for sharing.